Lately all of these messages are coming to me. There is a quiet voice guiding me with each step and nurturing me towards living a more authentic life. With each passing day, I seem to be taking better care of my body, my spirit, and our world. Even this project #The100DayProject is fueling me as an activist, a dreamer, and a creative soul. More and more I am loving myself just as I am and slowly releasing the people and things that no longer serve me. In fact, I have begun to think of this time as ‘Shedding the Weight’. perform “a simple act of caring”. “believe that I can make a difference and then go our and do it. take time to nurture my spirit and navigate what I need so that I can remain present for others. and so much more. . . .(hoping for 89 more days worth. The quiet voice is teaching me to take one step and then another. As I think my teacher SARK would say, I need to allow for the wisdom of the inner wise soul and allow her to guide me so that I can best show up and navigate all the moving parts of my life including repairing our world. If you really took the time you need to listen to the quiet voice within you, what would you do differently? How would you change? I am only one; but still I am one. My dear friend and spiritual brother, Dr. Paul Zeitz wrote a book, Waging Justice: A Doctor’s Journey To Speak Truth And Be Bold. Both in his book and in his life, Paul reminds me to deal with my stuff and then do the holy work of healing the world. There is no time for twiddling my thumbs and ignoring all the realities in front of me. As a healer, Paul takes on the world – sometimes as a doctor, sometimes as an activist, and always as a loving human. I do not think there is a day that goes by when he doesn’t actively and very consciously “wage justice”. While reading Waging Justice, I kept being reminded that the power to make a difference comes from the deepest place within. Life can be really hard sometimes. As a thriver, I know that regardless of what one may be navigating, the sun and moon visit daily. This affords each of us the opportunity to shake off the darkness and do whatever can for others and our world too. Again and again, throughout his book, I feel like Dr. Paul Zeitz is speaking to me. There is no place for complacency or inaction. If you want to repair the world, just do the work that needs to be done. We all have our struggles and Paul was absolutely no exception. The gift that Paul gives his friends and the reader of his book is that he utilizes every life experience as a catalyst to make our world a better place. With each step you take, may inspiration flow and mentors appear. Keep your eyes open and your entire being ready to do whatever you can to touch not only our world, but the entire universe in a positive way. May we all WAGE JUSTICE throughout our lives. Only through showing up will our world emerge better than it is today. Not only can we do this work, we must do this work – together. Being an activist means taking the time to take care of yourself. This is what I’ve come to think of as a non negotiable. If I don’t take care of myself, how can I do what it takes to repair our world? This year’s gifts have exceeded anything that I could have thought possible. To say that I was humbled by the love is an understatement. Now that I am moving to a healing place for both my body and my soul, it is time to reflect inwardly and do the holy work of grounding myself. 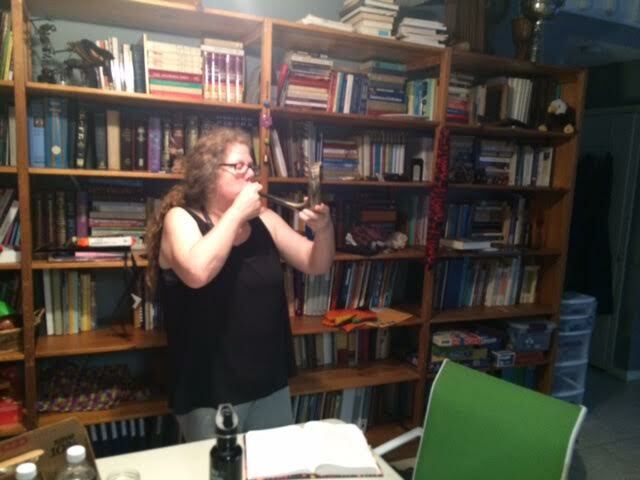 Today I realized how the shofar calls to me in a way I never thought of before; it feels like a healing instrument with each sound bringing clarity and strength to my core being. Tekiah ― one long, straight blast. Meaning: Remember that I am part of a larger universe. With that knowledge, I need to do the Godly work of tikkun olam, repairing the world; this isn’t a choice, this is a calling. Meaning: “When we think about the year gone by, we know deep down that we’ve failed to live up to our full potential. In the coming year, we yearn not to waste that opportunity ever again. The Kabbalists say that Shevarim ― three medium, wailing blasts ― is the sobbing cry of a Jewish heart ― yearning to connect, to grow, to achieve.”* May I connect, grow, and evolve to do the holy work that is part of my calling. The Universe is calling to me; I have so much to do! It is time to be more present. So much is calling my name; I have yet to do enough. Can I ever do enough? Step by step, I will continue to do what I must do. And while there is much to do, I can only do what I can do. Maybe I can inspire others to do the same. And perhaps that can be enough. Finding a new rhythm as I create new spiritual space in Houston and continue to serve the larger world. The sounds of the shofar inspire me to wake up and live more consciously. Over this coming year, may I make a difference for good and impact the universe that I am blessed to call home. Only when people learn to truly hear one another will we have a chance of peace. Lately I have been considering how much I love passionate people, people with conviction. With that passion comes so many challenges and so many gifts too. Yesterday I lost a friend who could not see the world through my eyes; she couldn’t trust that I could politically love Israel and think as I do. I loved this friend, but when she saw me as a villain the love slipped into the dark shadows that are now beyond my reach. There is no chance of healing that friendship. Ironically, I am not sad; however, I am perplexed. As much as I love passion, I am challenged by the passion that creates a void in listening and communication. Sometimes I have trouble listening to the words and the silence between the words; both spoken and unspoken language matter. But only through listening to others can I gain honest perspective or insight into what is happening around me. Knowledge is a tool and only through tools can people develop a clear understanding. At the same time, it is hard to listen to views that are clearly divergent from one’s own. The expression “know your enemy” comes to mind here, but in love and friendship, it is a gift to be able to honor one another’s differences. OK, now comes the another challenge, realize that people with different opinions are not necessarily the enemy, sometimes insight comes from different perspectives. For me, a significant challenge comes when I discover prejudice and generalities about different groups of people. I have no respect or patience for generalizations of color, race, religion, etc. The mere thought that generalizations exist is disturbing and yet sometimes it feels like the generalizations make sense. But generalizations don’t have a place in moving forward and healing the world; they hurt in every way. Since the J Street Conference, I have found myself struggling with disdain for the environment that has bred so much of what I see in Israel today. And yet, I have a responsibility to hear “the other side” even if it doesn’t resonate with me. The question is how to find holy ground. I am not certain that it is possible and yet we, as a people, have to work towards holy ground. The world can be scary. But if we stay in relationship with the world around us and friends learn to listen to one another, perhaps everyone can be part of the solution of making our world a better place. Passion really can be the gift that can ultimately repair the world.